We all have those great comfy Tee’s that we sleep in. Sometimes the prints on them are so great, I wish I could wear them out and not just when I’m lounging around- being lazy. So I thought I’d turn this large men’s shirt into a dress. It was pretty simple. I’ll take you through the steps. 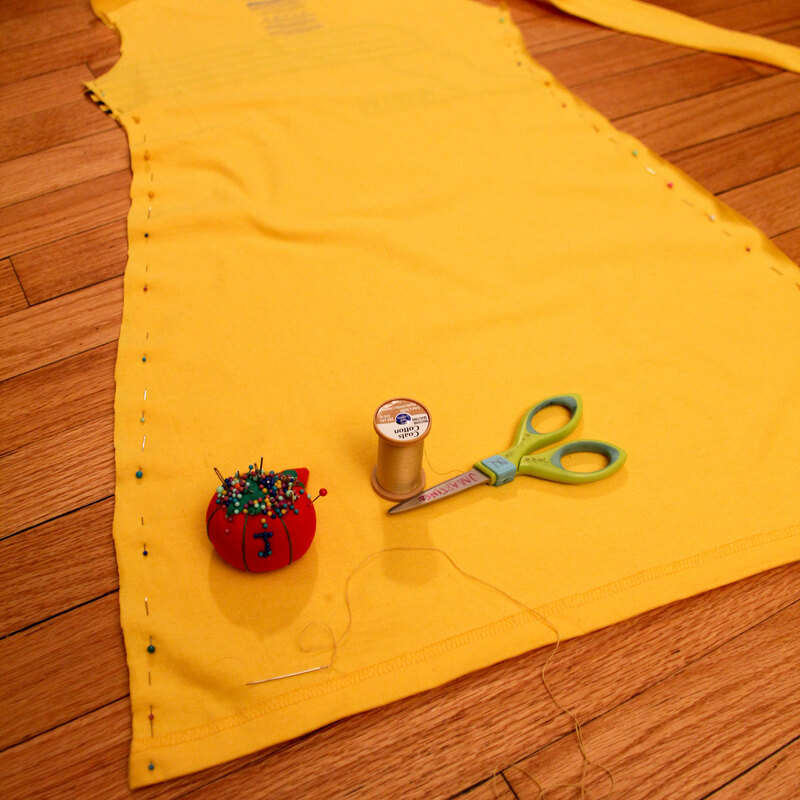 First, use a pre-existing dress to cut a pattern so that you can make sure it fits you. (cut it a little bigger than your dress so it allows room for the new seem) Then flip it inside out and pin it along the side so that you can sew up the two edges that you’ve cut. 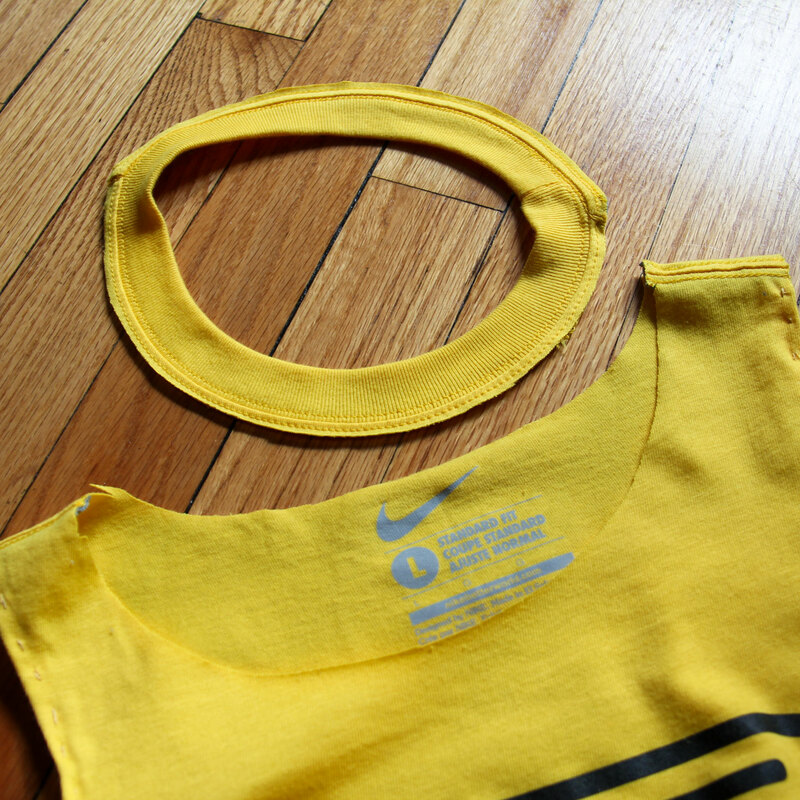 Next, cut the neck of the T-Shirt off and then simply cut away to adjust the arm holes. And there you go! 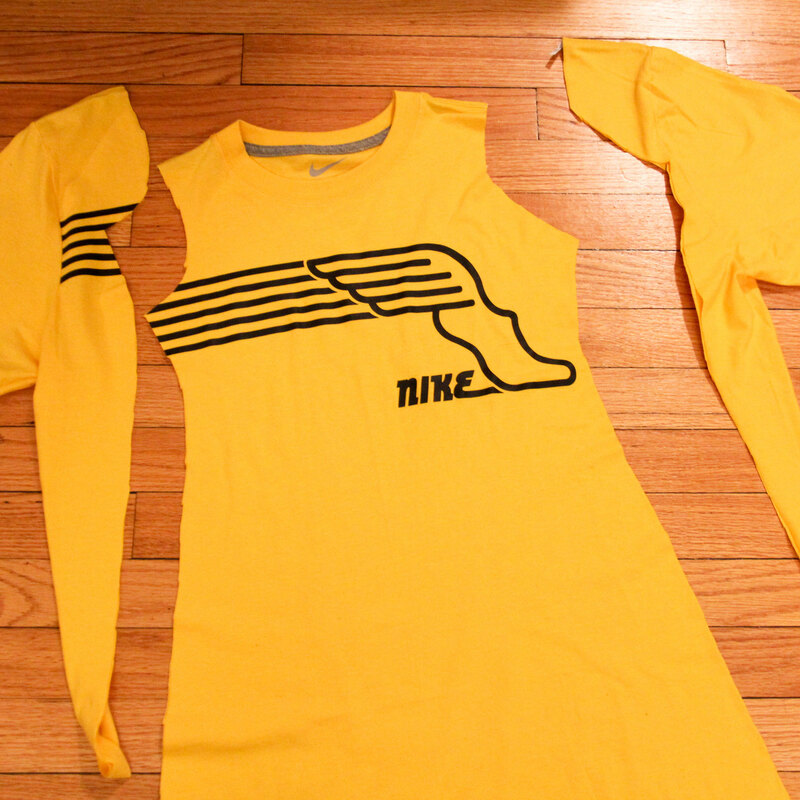 Shirt to dress in just a few minutes. I really loved how the dress turned out! 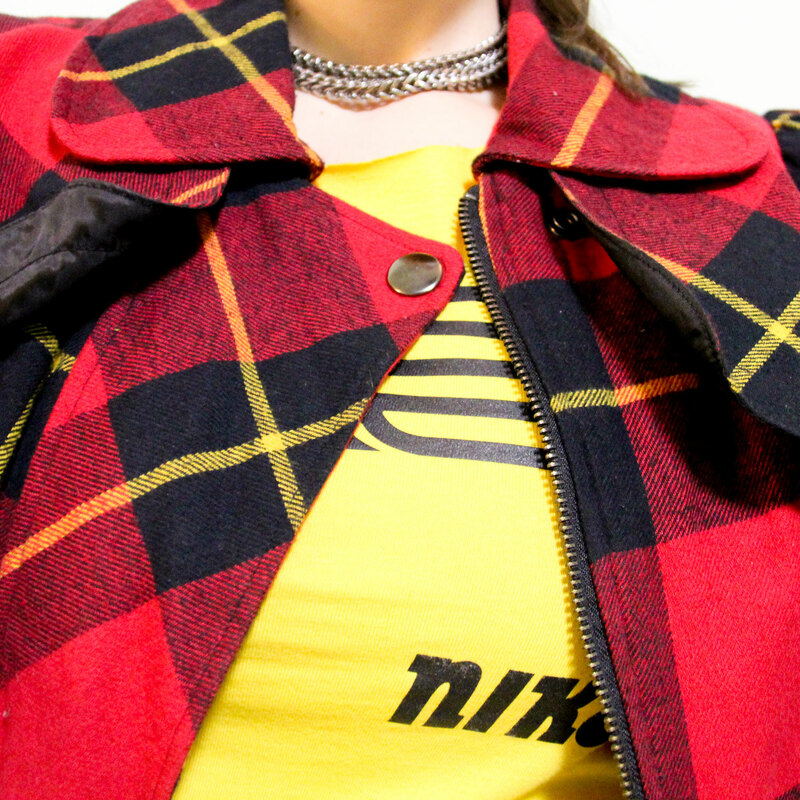 It makes for a really sporty look. I paired it with my Nike Blue Chips, Under Armour leggings, and Forever 21 jacket. Now it’s your turn! Let’s see what you come up with. ← I’m pretty certain we’re sole mates. I am ging to try this! thanks for the cool post! of course! if you blog about it, send me the link! Wow! This was so cool! And easy as well. You’ve seriously paired it up pretty darn well. Where did u get that jacket from? why thank ya! the jacket is from Forever21! Wow! You are innovative, artistic and a fashion genius. You are also a good model and very photogenic. Who takes the pictures of you? They do a good job too. haha- it’s kinda ridiculous. I take the photos of myself. It’s really fun! 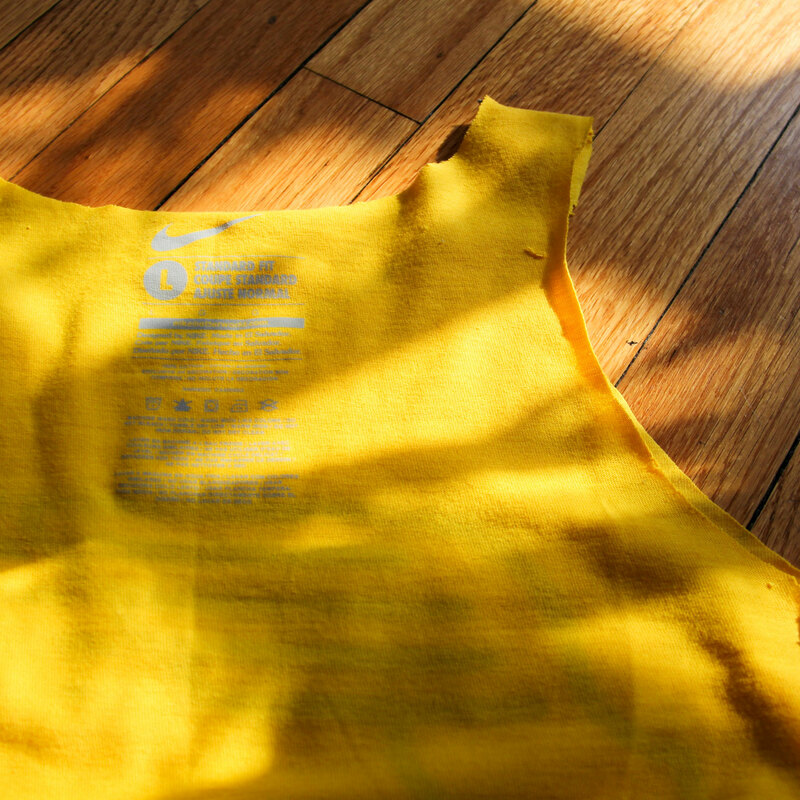 I have another shirt that I’m going to try and turn into something else too. I love the transformation from over-sized t-shirt to shapely dress. What a great look teamed with the leggings and the jacket!! Love it! I’m gonna try it! What a great transformation! I’m going to have my girls check it out. Wow! That’s really cool! I’ve tried to cut up my t-shirts before, but never successfully. Will give this ago! Nice!!! Reusing and repurposing are two of the cornerstones of living a green lifestyle. Not only do you look mahvelous, but you’re doing the planet a favor by keeping something out of landfills. Well done!!! Hey Jennifer. I have been secretly watching your blog (shhh don’t tell anyone) and I like your creativity and style. 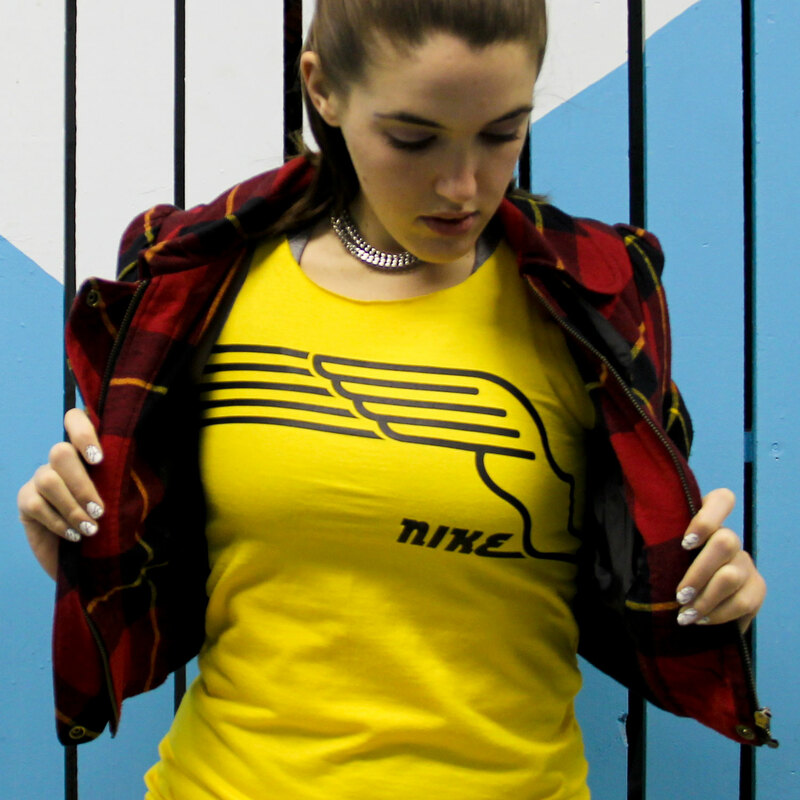 Contact me I would love to send you over a shirt or sweater from one Nike lover to another. Too cute! I am going to do this for my girls! They love wearing Daddy’s shirts. Hopefully he will give a couple up!! Thank you for sharing this awesome idea!! Interesting idea. The nail art is awesome too. thank you for the repost! you rock! There is something seriously cool about a female who makes stuff. you might like my other blog. checked it out………… very cool……. how can so much awesome fit in one small person?? Dude! Genius! 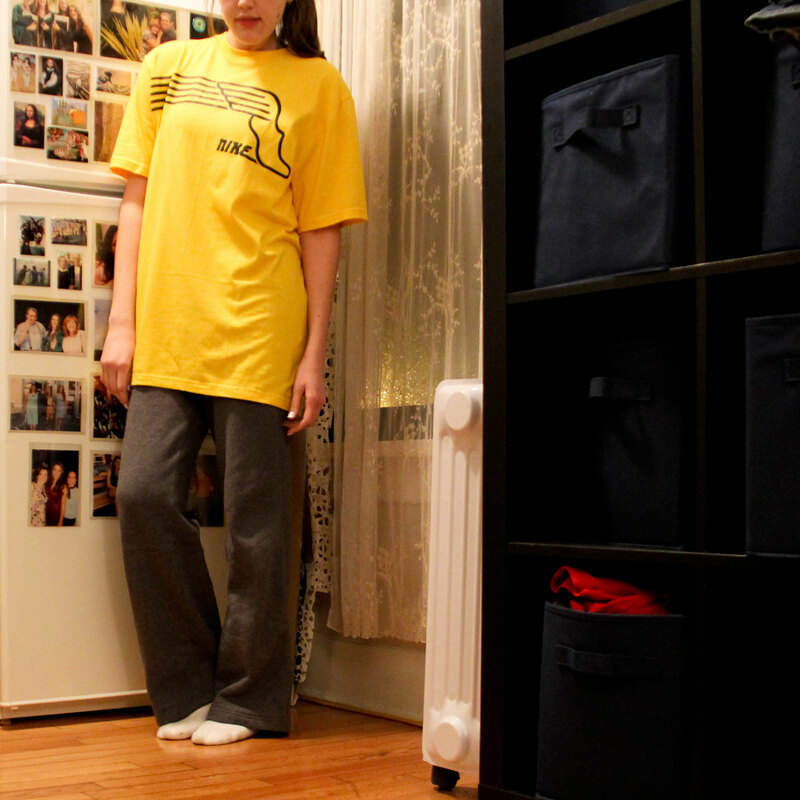 I usually get handed the largest shirt at corporate events – ladies Ts aren’t that common. I now have something to do with them, other than sleep them. Thanks! Love love love it! I am going to have to try this soon! That is so cool! I think I might try it with one of my boyfriends t-shirts! I love the pics as well btw you really have showcased your work well. Ill look forward to seeing more posts! you definitely should! It’s not too hard! and thanks so much, Sophie. Such a cute dress. Thanks for sharing how you made it, I will have to make one of these for my daughter. Nice designs and photo’s. Thanks for following the Sundog Drift! You are so clever and cute! Great idea. Thanks for visiting my blog. I’m glad I got to see what you’re up to! aw thank you! keep up the fun blog! great!! it’s a fun craft to do with someone! That’s cool! You rocked it! Very clever. Great improvement on the T.
why thank, ya! It’s pretty easy to do too! Awesome post! 🙂 thanks for the follow! Great idea and very versatile. Way back in the dinosaur age, I majored in Home Economics in college and I loved it! And although it led me to become the President of my own residential and commercial design/build firm, my first love was sewing. I actually made, and tailored, a woman’s suit as my senior project. You name it and I’ve designed and sewn it – draperies, bed hangings, children’s clothes, slipcovers, my clothes, bathrobes, pillow cushions, tablecloths, napkins, gowns, Halloween costumes, etc. Just as you’ve discovered, sewing can be one of the most rewarding and productive of pastimes. Thanks for following my blog. You’re so sweet to share! Sewing really is rewarding, and a huge stress reliever. Sounds like you’re a very talented! (much more capable at that sort of thing than I am) Thanks for sharing! I said I’d do some fashion! 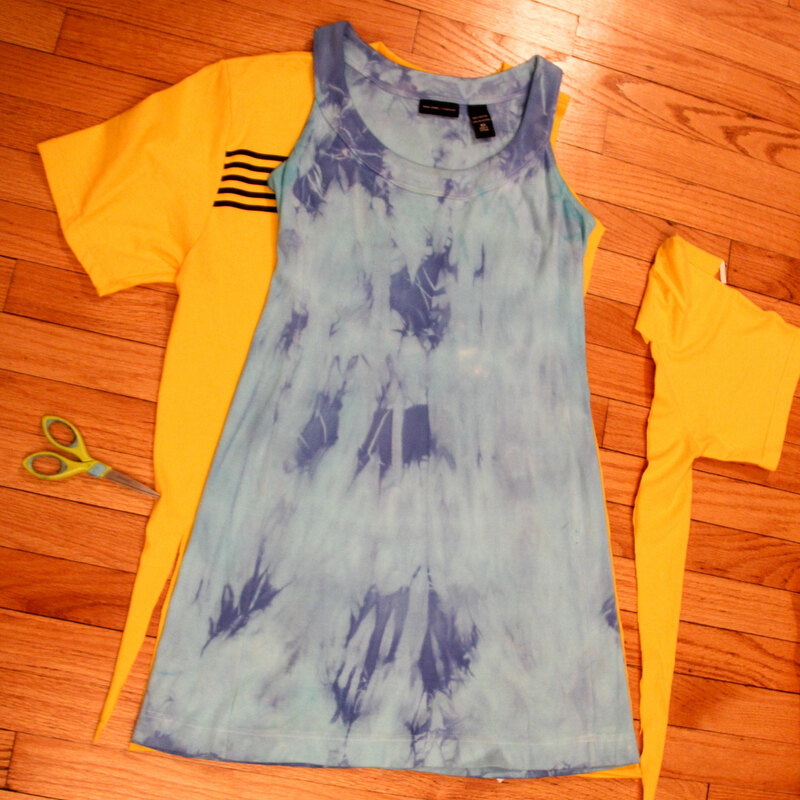 And here is a super easy and super cool DIY step to step guide for making an awesome tank top! Way to go, jennifermdarling! Thank you so much, Rose! You rock! Just wondering what size shirt did you use? I think it was a men’s medium…If I’m remembering correctly. Good luck with the crafting!